How can libraries match the search experience of Google, to help their users tap into worthwhile resources through a single inquiry? One commercial product that seeks to accomplish this is Summon, by Serials Solutions. Librarians from three area university libraries met at Falvey on June 14 to explore and evaluate their experiences with this new discovery tool. 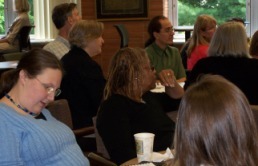 The LVJ Institute, an annual gathering, includes librarians and staff members from La Salle University, Villanova University and Saint Joseph’s University. Villanova University Librarian Joe Lucia opened the day’s session with the observation that users now believe, based on their day-to-day searching experiences, that “they should be able to discover what they want” through library web pages. Libraries typically provide proprietary information through structured databases not available on the open web: Overcoming that barrier is the goal of these products. Marjorie Rathbone, Kristine Mudrick and Susan Cheney, from Saint Joseph’s Drexel Library, and Sheryl Panka-Bryman and Eithne Bearden, from La Salle’s Connelly Library, kicked off the session by describing how they got Summon up and running at their respective institutions. Demian Katz, library technology development specialist, spoke on “Tweaking Summon at Falvey.” He described how feedback from the librarians provided him with valuable information on how to make the best use of the Summon service when incorporating it into VuFind, Falvey’s search portal. For several years,VuFind has provided a user-friendly and flexible interface for finding books, videos and other resources in the library; now, with the addition of Summon, it is also possible to search millions of journal articles and other electronic resources from many of the library’s subscriptions. Three librarians from Temple University’s Samuel L. Paley Library, where Summon has recently been implemented, spoke next. Jenifer Lee Baldwin, Krystal Lewis and Fred Rowland described plans for marketing the new resource to their users and for incorporating it into information literacy sessions, particularly for first-year students. They led a breakout session during which institute attendees from La Salle, Villanova and Saint Joseph’s explored how they could apply Summon to these tasks at their institutions. Hauck and Barbara Quintiliano, Falvey instructional design librarian, coordinated the meeting, aided by members of the Outreach team. This is very fascinating. I would love to see a follow up article about further developments. Have any of the schools considered the possibility of Google Search Appliance (GSA) – http://www.google.com/enterprise/search/gsa.html. This is something that I looked into a while ago. I am interested in seeing how they compare. I worked with a Google Search Appliance at a previous job and found it extremely frustrating — the device has a mind of its own and offers very little user control; you make suggestions and then it does what it wants. This was several years ago, so perhaps things have changed, but I’m so happy using Solr (which is not only easier to control but also happens to be free and open source) that I would never consider going back to a GSA.